Here is a top that's the first of an upcoming series. 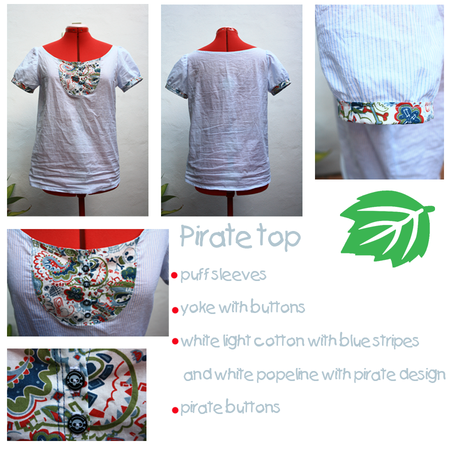 I've had the pirate fabric for quite some time and when I saw the pirate buttons I thought that they'd go perfectly together as a yoke. So I just had to draw a pattern and off I went! I made it before dress n°1; I actually used it as a base for the dress. So here are the photos. Sorry about the bad quality, the fabric is quite difficult to shoot (and yes I'll iron the next clothes, but this top is mine so it's been worn already!) Click on the picture to zoom in!